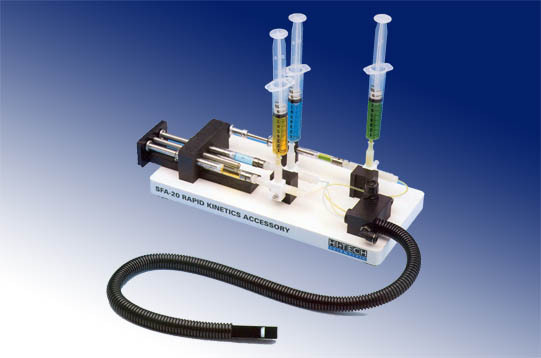 The SFA-20 rapid mixing accessory has remained a popular choice for users who want to add a stopped-flow capability or simply a means of rapidly mixing reagents in the context of a commercial UV/Vis or fluorescence instrument. It may be adopted as an entry level stopped-flow device but is capable of producing results for genuine research applications. It has a nominal deadtime < 8ms, allowing reaction rates of up to 100 s-1 to be monitored, depending on the response time of the spectrometer. High precision, research grade, gas-tight syringes are used and are available in volumes from 250 µl to 5 ml. 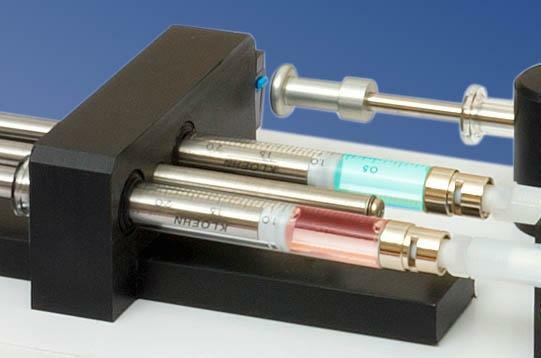 Variable ratio mixing applications are readily accommodated since the syringes are mounted outside the thermostatically controlled sample circuit, allowing easy and rapid replacement. This also prevents any possibility of leaks at low temperatures. The syringes are mounted on a rigid drive platform ensuring that the flow is stopped precisely and instantaneously. This platform and the syringe mounting blocks are extremely resistant to chemical attack. The thermostatted sample circuit itself is constructed from materials which also provide optimum chemical resistance. Reagents travel in this inert sample circuit through an umbilical cord to the flow cell where they are mixed by a high efficiency T-format mixer. The cell offers both 2 mm and 10 mm optical path lengths as standard. 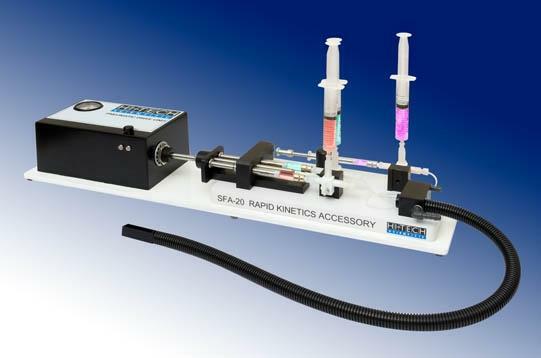 The standard flow cell supplied with the SFA-20 Series will fit any UV/Visible spectrophotometer or spectrofluorimeter having standard 1 cm cuvette holder and a 15 mm beam height. However, flow cells can be tailored for instruments with different beam height and optical geometry. An anaerobic kit to extend the use of the SFA-20 to applications where oxygen must be excluded. 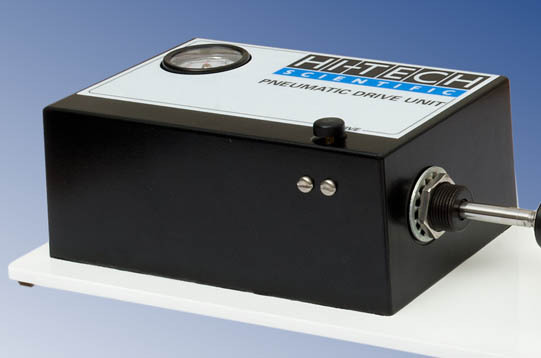 A pneumatic drive attachment for enhanced shot-to-shot reproducibility. A range of different size drive syringes for variable ratio mixing. The SFA-20M is a microvolume version of the standard accessory. With a dead volume of just 350 µl per reagent, it is ideally suited to leading edge research where only small quantities of novel or expensive materials are available. The SFA-20mx incorporates two mixers separated by a 10 µl delay loop. This enables two reagents to be mixed prior to a third reagent being introduced and mixed immediately before the observation chamber. It can also be used for single mixing and 2:1 ratio single mixing without the need to change syringes. The SFA-20mxM combines the benefits of microvolume operation with multi-mixing capabilities. Edinburgh Instruments integrate the SFA20 in to their FLS1000, FS5 and LP980 instruments. Note: Multi-Mixing and Micro-volume versions of the above are available on request. Special versions of the SFA-20 are available on request. ²W. A. Findlay, S. R. Martin, K. Beckingham and P. M. Bayley, Biochemistry, (1995), 34:2087-2094.